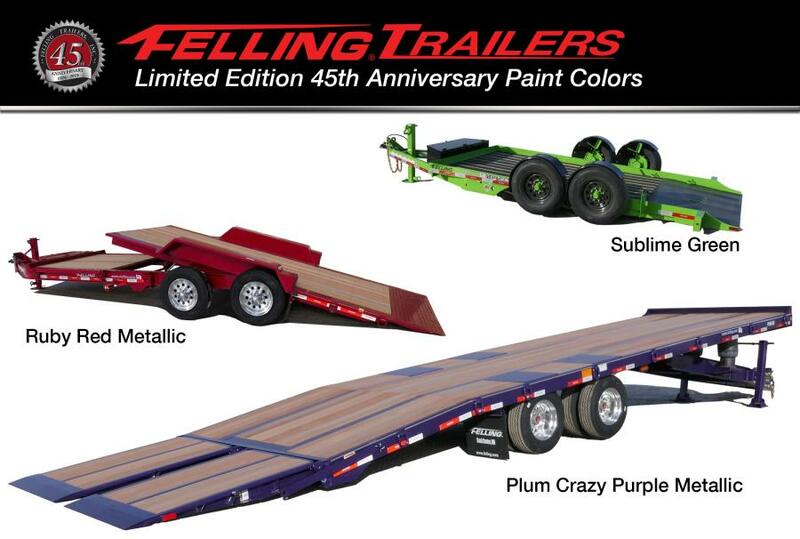 To commemorate its anniversary, Felling has selected three limited edition paint colors — Plum Crazy Purple Metallic, Ruby Red Metallic and Sublime Green. January 1st not only marked the start of the 2019 year but for Felling Trailers Inc. it marks 45-years in the business of manufacturing trailers. To commemorate this significant anniversary, the company has selected three limited edition paint colors — Plum Crazy Purple Metallic, Ruby Red Metallic and Sublime Green. The limited edition anniversary colors will be available for purchase to Felling customers for the extent of 2019. Along with this, all trailers manufactured during Felling's 2019 anniversary year will don a commemorative decal marking it as a 45th-anniversary edition trailer. For Felling, the color selection process started with three-color shades and then moved on to complete a color match with the assistance of Felling's PPG representative. With the final colors selected, PPG worked with its lab to ensure the chosen colors would provide the same quality coverage and color luster that Felling's customers have come to expect. With the start of trade show season gearing up for the company, the decision was made to debut these anniversary colors to the crowds at upcoming industry trade shows. The Plum Crazy Purple Metallic color will be on display in Felling's World of Asphalt booth, #13128, on Felling's FT-40-2 TA (air tilt) trailer Feb. 12 to 14 in Indianapolis, Ind. The Sublime Green color will be on display in Felling's booth, #4723, at The ARA Show (The Rental Show) on a Felling FT-12 EZT EZ-Tilt trailer Feb. 19 to 21 in Anaheim, Calif. The Ruby Red Metallic, painted on an FT-16 IT-I, will be on display at various Felling Dealer events throughout the first part of the year.